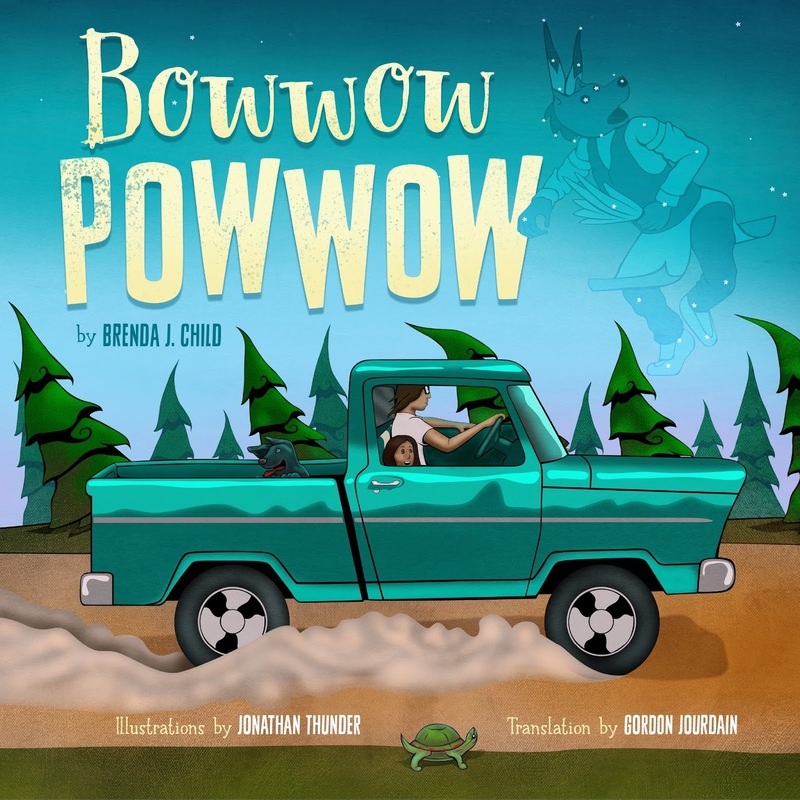 Due out on May 1 of 2018 is an absolutely terrific book, Bowwow Powwow written by Brenda J. Child (Red Lake Ojibwe). 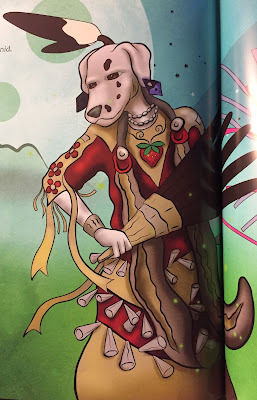 The story she tells was translated into Ojibwe by Gordon Jourdain (Lac La Croix First Nation), and Jonathan Thunder (Red Lake Ojibwe) did the extraordinary illustrations. Windy Girl is blessed with a vivid imagination. From Uncle she gathers stories of long-ago traditions, about dances and sharing and gratitude. Windy can tell such stories herself–about her dog, Itchy Boy, and the way he dances to request a treat and how he wriggles with joy in response to, well, just about everything. When Uncle and Windy Girl and Itchy Boy attend a powwow, Windy watches the dancers and listens to the singers. She eats tasty food and joins family and friends around the campfire. Later, Windy falls asleep under the stars. Now Uncle's stories inspire other visions in her head: a bowwow powwow, where all the dancers are dogs. In these magical scenes, Windy sees veterans in a Grand Entry, and a visiting drum group, and traditional dancers, grass dancers, and jingle-dress dancers–all with telltale ears and paws and tails. All celebrating in song and dance. All attesting to the wonder of the powwow. This playful story by Brenda Child is accompanied by a companion retelling in Ojibwe by Gordon Jourdain and brought to life by Jonathan Thunder's vibrant dreamscapes. The result is a powwow tale for the ages. Frankly, there's so much I love about this book that I'm not sure where to start! Direct your eyes back up to that cover. That's Windy with her uncle, in his truck. Right away, I am grinning. See, when we were kids, my dad had a white truck, but my little brother's favorite color was green, so my dad took his truck to one of those discount paint shops (ummm.... I suppose a lot of you are going, 'what is that'? but some of you know EXACTLY what I mean) and had it painted green! And we all went everywhere in that truck. Our dogs, did, too. Sometimes they were up front in the cab, and sometimes they were riding in the back, just like Itchy Boy is on the cover. What I mean to say is that the cover for Bowwow Powwow has an immediacy that Native kids are gonna respond to. It is, in other words, a mirror of the life of a Native kid. Moving beyond the cover, I can tell you how much Native kids who do every thing with their dogs are going to like it. By every thing, I mean Every Thing. For Windy, that includes fishing (the page of ice fishing is hilarious) or, curling up together for the night, like she does with Itchy in this bit I'm inserting below... Or I can tell you that parents and teachers helping kids learn Ojibwe are going to like it. I love seeing Indigenous languages in kids books! Or I can tell you that kids who go to powwows are going to love it. That illustration of Windy sleeping launches Bowwow Powwow into a dream sequence that I adore. At that point in the story, Windy is at the end of a very good powwow that is going on, late, into the night. She's fallen asleep, listening to a drum. 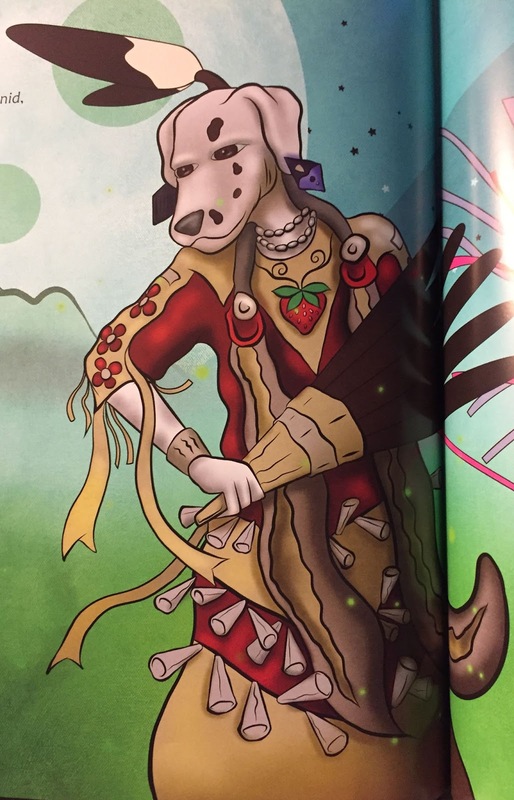 She dreams of the elders who teach her, and the veterans who are in the Grand Entry, and the traditional dancers, and the grass dancers, and the jingle dancers, and the fancy dancers... but they're all dogs! On their way to the powwow, Windy's uncle told her about dances that came before the powwow. As they drive, he's passing along some oral history about dancers going from house to house, singing "we are like dogs." And, the people in the houses gave them gifts of food, or maple sugar candy, or beads. The dance is about generosity, about sharing. In the back of the book, there's a note about that particular dance and how it was misunderstood and misrepresented by anthropologists who erred in calling it a "begging dance." We Pueblo Indians have a similar problem. Outsiders didn't understand a dance we do that includes a sharing of foods and other items. One outside writer, in particular, wrote a children's book where she misrepresented it as a food fight like you see in a cafeteria. Outsiders. Ugh. I can tell you that those of us who know something about sovereignty are going to spot something in here that's gonna make us say "YEAH" (it is the license plate on the truck). What I mean is this: there's many points in Bowwow Powwow where the words or art tell us that this is an #OwnVoices story! The three people who gave us this book know what they're doing. I highly recommend it for every school and public library. I know--I'm going on a bit about its significance to Native readers--but non-Native readers will enjoy it, too. It is tribally specific, and it is set in the present day, and it beautifully captures Ojibwe people. Pardon my corny "what's not to love" --- because this book? It is an absolute delight! Head right on over to the Minnesota Historical Society's website and order it! This makes me smile. ^_^ I'll check to see if I can get my local library to order this book. Maybe they are already cool and know, which would be awesome. Thank you for this review! Pre-ordering this for my early childhood library's collection now. This was a very helpful review. The book looks beautifully written and illustrated. I love that the storyline introduces children to a culture that they may know little to nothing about. I also love that children of American Indian heritage have a story that they can identify with and that celebrates that heritage. The inclusion of the close relationship between the child and her dog will make it relatable to many and adds a fun detail that will keep young readers following the fun. And I must add: this book is also a very good antidote to many of those white-authored books that insensitively portray Amerindians as anthropomorphic animals!